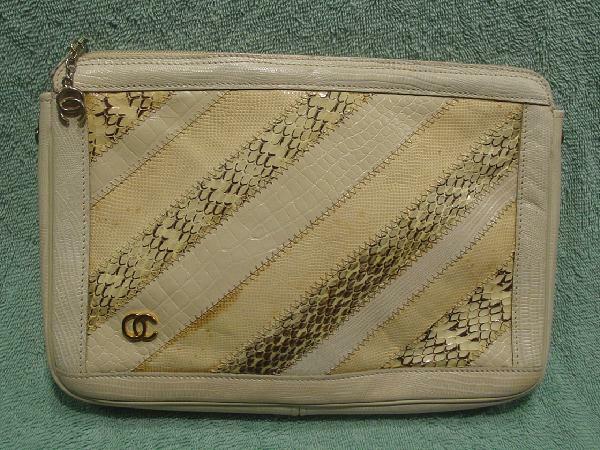 This vintage cream yellow and bone leather purse has pattern strips of faux yellow cream lizard, bone lizard and alligator, and strips of real snakeskin in cream and brown. The bottom, top sides, and trim are in a faux lizard pattern. It has a top zipper closure with a gold-tone interlocking OC ornament attached to the zipper and another gold-tone interlocking OC ornament on the front left corner area. 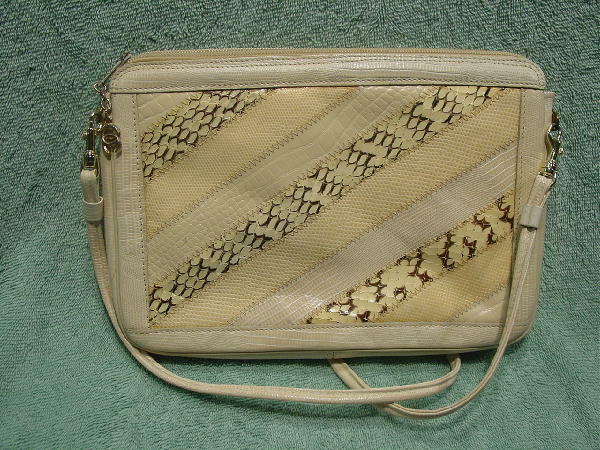 There is a detachable bone faux lizard pattern 33" shoulder strap. The interior is in a light tan with Oleg Cassini and OC printed all over. There is a large interior side zipper compartment with fabric on one side. There are light orange spots on the three yellow-cream strips on the front side. 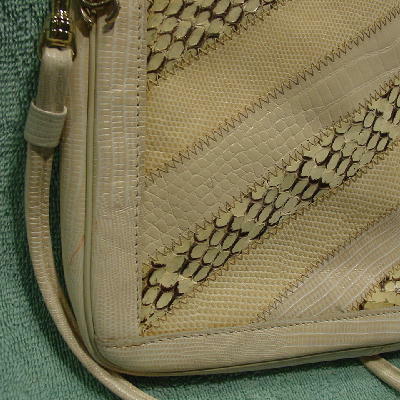 There is a tiny (1/8" long) scratch on the left side of the middle faux alligator strip on the back, and a light red line mark on the left back side. The hooks of the shoulder strap have some of their gold-tone coating missing from their sides. There is some darkening on the diagonal strip below the OC. There is a black E on the lining near the top in the center. Eden took the purse to Mexico with her on a job and wanted to make sure it wasn't going to "get up and walk away" with another model.